Travelling to your own home, skillful tailors make warm cotton blankets which can be recycled and the cotton used again after 10 years. So I thought to negotiate with them to make us 8 warm blankets for the winter for our disabled children. 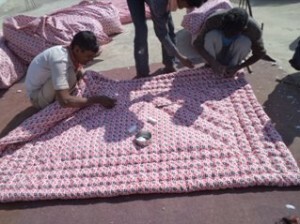 They agreed to provide us good quality of warm cotton blankets at a reasonable price.